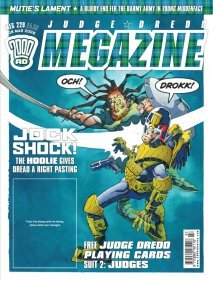 Quite a plain cover, just a small picture of Judge Dread (sic) fighting the Hoolie. Nice to see Kenny Who? getting some work drawing this cover. Of course, Kenny is actually Cam Kennedy, and I'm a pretty big fan of his so it was always going to be a 'like'. So let's start with our cover star in the Dredd story Who? Dares Wins. I liked the fact we got to see the first episode of Kenny's trashzine, with Cam drawing it in a subtly different style to that of the main strip. Kenny thinks his luck has finally changed, but the long arm of the law, or should that be the real Judge Dredd, is never far away. The highlight was the legal droid who gave me a bit of a chuckle. Good story this one; Wagner on top form. Part 2 of the Shimura story Deus X was a good episode. I'm getting to really enjoy the exploits of this Ronin Hondo Judge, but I still have a bit of a problem with the way Andy Clarke draws some of the fight scenes. It can be tricky working out what is going on in each panel. I suspect this is pretty hard to draw. Robbie Morrison's story is top notch and action packed. I liked the characters and the plot, so am giving the art a lot of slack. Young Middenface wraps up this issue with the Muties frantically trying to escape overwhelming Kreeler forces. I thought it was a good ending and enjoyed the fact that this story was given more room to be told; being 6 parts rather than the usual 3. It seemed a significant development in this universe, and I'm keen to see what happens next. As always, Grant and Ridgeway do a cracking job with this episode. A new story started this month as Bato Loco makes a welcome return to the pages of the Meg. Rennie and Coleby are on duty as always and the story opens with a full page splash of our hero in a bit of a tight spot. So how does he end up pointing a gun at a very angry looking Dredd? Well, to quote Bato, "Have patience, mios hermanos..." as the strip takes us back in time to how it all started. Only 6 pages, but a good episode. There was a lot to like about both script and art. Looking forward to the next outing. Lots of 'walking and talking' in this episode of The Bogie Man story Return to Casablanca. Lots of text in speech bubbles, and being written in 'Scottish' it does need a bit of patience and concentration. Still, it was an alright episode. I'm not mad about this story, but it's not that I don't like it either. Out it like this, if it wasn't printed in the next Meg, for some odd reason, I wouldn't be that bothered. I'd be livid if that happened to Bato Loco or Shimura or Kenny Who? The Anderson is moving onwards. I can't help but feel that we aren't really getting anywhere with finding out who or what is behind the strange goings on. Maybe that is Alan Grant's intention, but it makes for a pretty dull read right now. It's seems to me that it is a series of events that have the judges running around panicking, but the story isn't going forwards. Still, we have the return of a character we first met in the early Megs and she may well light up the storyline (bit of a clue there, I shall reveal more next time!). The reprint was a Dredd called Alzheimer's Block and sees an eldester suspect more than just natural deaths are occurring in her block. Wagner wrote this one with Ridgeway and Perkins on art. I quite enjoyed this one. I liked the Miss Marple character and didn't see the twist coming at the end. Glad the Meg is still giving some space for reprints, even if it is much smaller now. A good text fiction story by Cavan Scott called Dog Fight where Dredd needs to track down some illegal fights of a slightly unusual nature. Good story, good twists and I'd like to read more from this author. Wasn't a big fan of the illustrations, but the style did suit the story. Cam Kennedy was interviewed by David Bishop for the Interrogation slot and the man has had a genuinely interesting life. I enjoyed reading this one, both as a fan of his art and also as a life story. Looking forward to part 2 next issue. You're Next Punk didn't feature Gordon, it was David Bishop instead. This wasn't good... Sorry David, you just aren't Gordon. Stick to The Dredd Files. Or not. Or Metro Dredd? No. Stick to Interrogations, yes, that's good stuff! In a slight break with tradition, I read the Si Spurrier Movie column which was OK. Nothing else in the Heatseekers section grabbed my attention. And finally... I thought I'd just say a quick word on the overall quality of the Meg. I spend time each column discussing individual episodes of stories, but I don't give a general overall feel. And generally, I'm pretty happy with the Meg. It has a nice selection of stories and text articles, and whilst I don't read everything, I certainly read the majority of things. There is a 'but'. We are getting a lot of the same stories over and over; Anderson seems to have been going forever. So I'd like a bit of variety, something new and different. Let's see what happens!